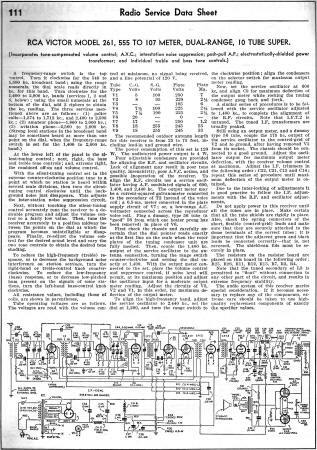 I have been scanning and posting Radio Service Data Sheets like this one featuring the RCA Victor Model 261, 555 to 107 meter, dual-range, 10-tube superheterodyne radio receiver for many years now (image to the left is from the RadioMuseum.org website). There are still many people who restore and service these vintage radios, and often it can be difficult or impossible to find schematics and/or tuning information. RCA Victor Model 261, 555 to 107 Meter, Dual-Range, 10 Tube Super. At the lower left of the panel is the silent-tuning control; next, right, the bass and treble tone controls; and, extreme right, the combined on-on and volume control. With the silent-tuning control set in the extreme counter-clockwise position tune to a point at which no station is heard within several scale divisions, then turn the silent-tuning control clockwise until the back­ground noise just disappears. 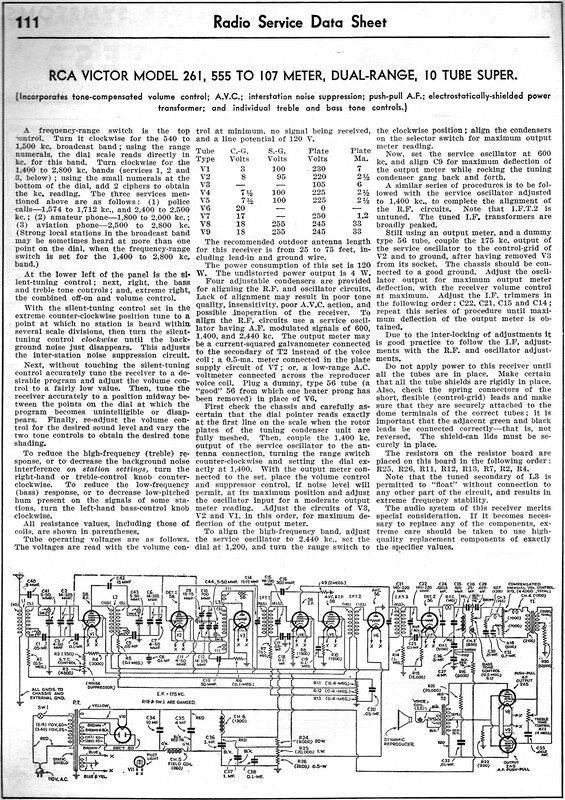 This adjusts the Inter-station noise suppression circuit.